If anyone were to be asked ‘where have you seen the best characterization of animal characters?’, then the most common reply would be Disney. Their exploration of the anthropomorphisation of animals set the benchmark for all future endeavours in this area, and few have been able to rise above the ceiling created by the animators and illustrators of Disney. But, after experiencing it, I have a new standard. Blacksad. Created by the award winning Spanish duo of writer Juan Díaz Canales and artist Juanjo Guarnido, this has become a hallmark work for me. The subtle and not-so-subtle plays of emotion, on the faces and bodies, of the animal characters make me stare in wonder. Filled with wonderfully realised parallels of humanity and the animal kingdom, they confirmed one essential truth for me. All humans are animals, and some animals are more than human. John Blacksad is one such entity. 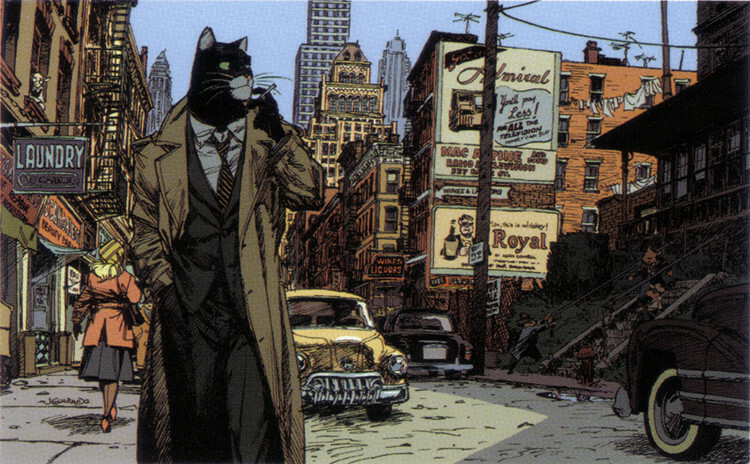 The feline detective/bodyguard/troubleshooter/troublemaker protagonist of the comic Blacksad, is one smooth cat in a world where playboys are lions, assassins are lizards, police chiefs are German Shepherds and slimy tabloid reporters are weasels. The women somehow tend to look more human than the men, but somehow I’m willing to overlook that, given that they are all extremely layered and strong characters in their own right. And it doesn’t get more right than the sultry Alma Mayer, a writer who catches Blacksad’s heart in Red Soul. The criminal element always seems to underestimate him, but then get their just, and satisfyingly poetic, rewards. It’s completely a ‘Men want to be him, and women want to be with him’ type of scene, but then he doesn’t irritate me like Bond, or Superman. He’s a poet, a cat of the streets, and an unsurprisingly tender person who can shoot a coin from 30 paces. Oh, he has attitude in spades: for instance, in the second volume, Arctic Nation, when asked by white supremacists (in this case a white Ermine) why he, a black Cat, has the temerity to be in their white only diner, he replies with a cocksure grin while pointing to the shock of white fur on his chin and blithely says “This ain’t enough for ya?”; before proceeding to toss him over the counter when the scene starts getting ugly. But the way he comforts a lost child in Somewhere Within The Shadows, and the sincerity of the emotion portrayed there, simply puts him outside of the typical masculine model of cool. Dealing with issues ranging from revenge, racism and communism to the nuclear arms race, the wide panorama of the tales has something for everyone. For me though, the beauty of this series is that even if there’s a ‘happy’ ending, sometimes no one wins. Rendered in a beautifully compelling, gritty yet rich noir style, the books take us into the world of 1950’s America in all its glory and shadow. Even forgetting the evocative art, just the stories alone will satiate the hungry monster in all of us. Filled with brilliant derivatives of classic tropes, the stories and the characters still lead you by the hand as you willingly plunge into a smorgasbord of emotions, hijinks and badassery while showing glimpses into the dark animals of the collective human soul. 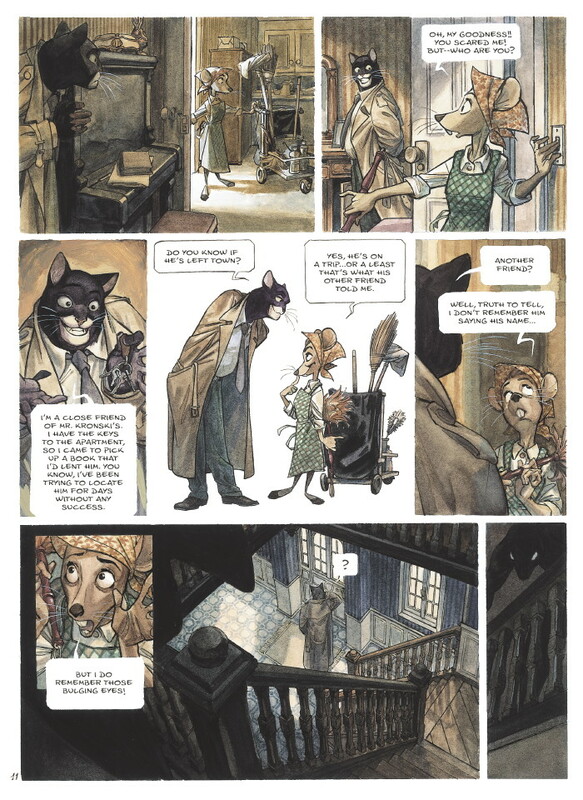 There are 5 volumes in the saga of Blacksad, with the fifth one being translated into English on the 21st of October, 2014. If you haven’t already encountered this series, I would recommend a long sit-down/personal acrobatic pose with your choice of beverage, and read these tales from cover to cover. I’m very sad that Blacksad isn’t that well known, and hope that more people will discover this brilliant series. In fact, when I picked up my hard copy of the collected first three volumes at the Bangalore ComicCon in 2013, there was only one other person who had bought a copy, a gentleman from foreign parts. When he found that I was his brethren, we shared a heartfelt hug. Hopefully, I will share one with some of you at future cons, after discussing the awesomeness of the cat, the icon, John Blacksad.